In this guide I would like to show how to overclock your memory in a simple way and how to check if your settings are actually optimal. I won’t show you how to make highest clock or tightest available timings because all memory is different, and I can’t guarantee any settings for that. Also realize that the CPU’s IMC (integrated memory controller) plays a big part in maximum clocks and stability. I’m trying to test all memory on air cooling with stock heat spreaders to have more comparable results. I’m also using single stage phase change cooling for the CPU, as lower CPU/IMC temperature gives more chance for higher memory overclock. 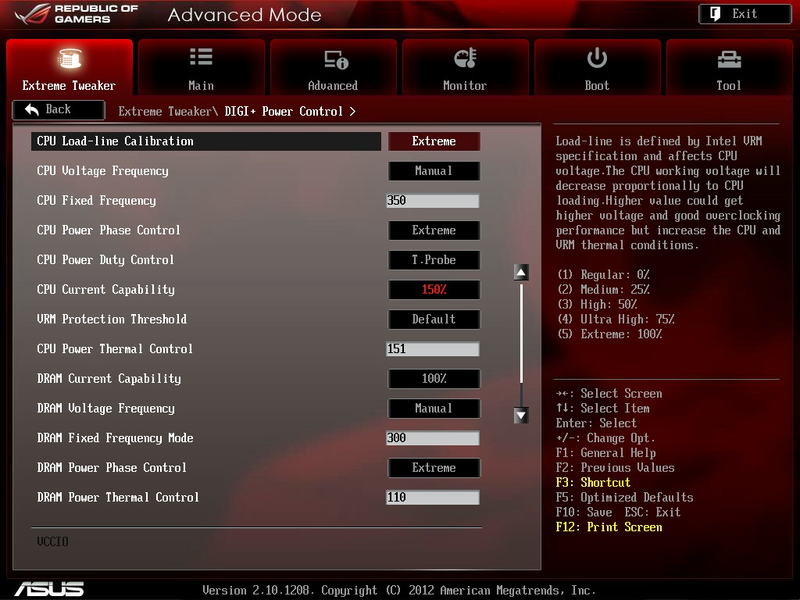 However, all settings in this guide were also checked on air cooling; all are possible to achieve with air/water cooling up to DDR3-2800. Not all settings in this guide will be perfectly stable so please read description. – VCCSA ( IMC / System Agent ) – memory controller voltage , can be helpful above 2400+ or while setting really low timings, I haven’t seen any difference above 1.35V for 3000+ memory clock. – VCCIO ( VTT / QPI ) – main voltage to play with while overclocking memory, Intel’s safe is also max MVG value – 1.4V for sub zero cooling, hard to say how much you will need for max clocks but it shouldn’t be more than ~1.35V for DDR3-2800. – VDIMM / Memory voltage – this is quite clear, max for most kits is about 1.9V ( like PSC ) but some IC may need 2V+ to make max clocks or low timings on higher clocks ( BBSE, Micron D9 ) and also will need sub zero cooling. Ivy Bridge supports memory ratio up to x32.00 on boards designed for overclocking, but as some already noticed, max ratio that is working on MVG is x29.33. 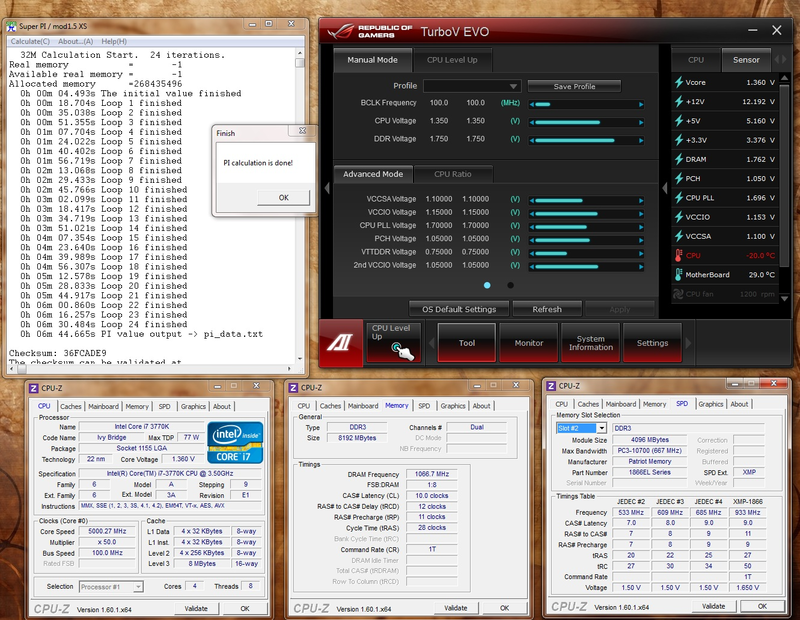 It’s enough to set DDR3-3226/1613MHz on better CPUs using BCLK ~110MHz. – 55 – memory won’t work so high at current settings, add some vdimm or loosen timings ( usually tRCD as 1st ). Setting it to Enabled you can gain stability at the cost of lower max OC. Setting it to Disabled you can gain higher max memory clock at the cost of stability. From my experience it is hard to pass tests like Spi32m when this option is Disabled. On the other hand, it is hard to boot with 2600+ when this option is Enabled. Disabling this option gives chance for some higher OC. In worst case nothing will change so it’s worth turning it off. I noticed that this option in some situations also helps to achieve higher memory clock. Can be enabled for any CPU frequency and it won’t hurt stability, as it did with Sandy Bridge. In this part I will try to show how to overclock more popular IC like PSC, Elpida BBSE, Hynix CFR, Samsung HCH9 and Micron D9. PSC – can be found in many various 2x2GB kits with XMP 1600 6-8-6, 2000 8-9-8/9-9-9 , 2133 9-10-9/9-11-9/7-10-7, 2200 7-10-10, 2400 9-11-9, 2500 9-11-9 …etc. Samsung HCH9– lately it’s very popular IC mainly because there are really cheap OEM Samsung 1600 kits, but also because most 2400-2600 kits are based on HCH9 like most of new TridentX, Team Xtreem and some others. 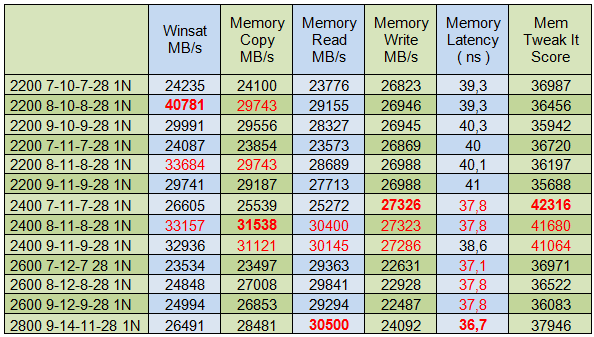 Micron D9- new series of D9 are almost only in Crucial Ballistix memory 1600-2133. First step for all IC is to set your BIOS/UEFI right. Some options depend on your own preferences but I will show how I make it. – Start from 100 bclk. – CPU bus speed : DRAM speed ratio doesn’t really matter. It can also be set to Auto. – Go to DIGI+ Power Control and change preferences. You may need to set DRAM Fixed Frequency Mode higher ( like 500 ) to achieve stability. This option bumps up VDIMM a bit under high load, so best if you check read points on PCB for more accurate voltage readings ( software is not working right in this case and is showing +/- what you set in BIOS ). – We won’t need extreme OV untill about 6GHz on CPU, and for memory probably never, unless we will try to break the World Record on LN2, so this option can be disabled. – CPU voltage depends on each CPU, I set it to 1.35V, as it’s all I need to make 5GHz using Single Stage cooling. – DRAM Voltage – depends on IC , in this case I set 1.750V for 2400 8-11-8 on PSC IC. – VCCSA – your probably won’t need more than 1.0V up to 2400, I set safe 1.1V for tests. – VCCIO – 1.25V should be enough for anything up to 2500, I’m using 1.15V for 2400. 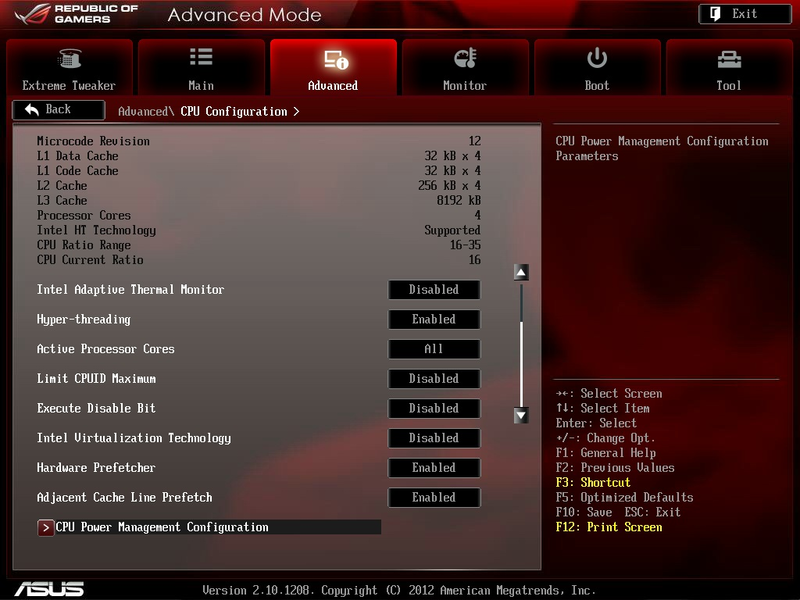 – CPU PLL- try to set it as low as it’s still stable, lower voltage = lower CPU/IMC temperature and higher overclocking. – other options are not really important so you can leave them on auto. In above part of this guide, I described how to set all other options. I won’t go back to this and I will only add what you should change to achieve higher memory clock or tighter timings for each IC. On below screenshots you may notice +/- 0.02V in VDIMM read, that is normal. I won’t recommend setting too high of a voltage if you don’t know what are you doing( especially on air cooling ). 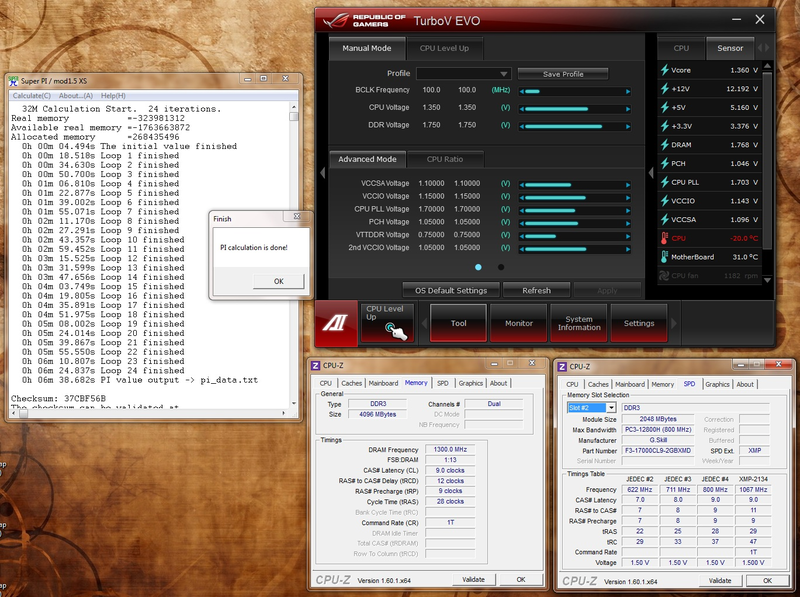 To show how to overclock PSC based memory, I picked G.Skill RipjawsX 2x2GB 2133 9-10-9-28 2N. Most PSC kits have standard voltage 1.65V +/- 0.1V so I will use 1.75V. 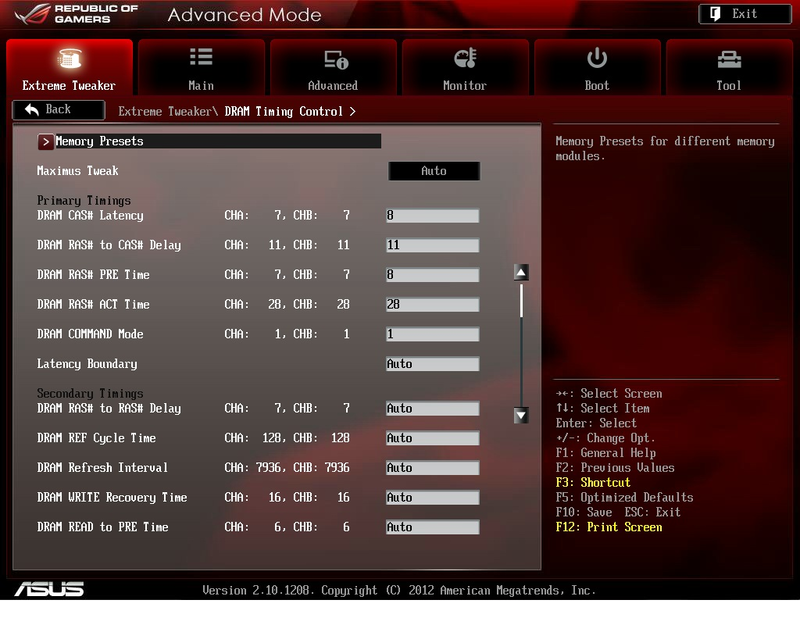 – Go to Memory Timing Control tab and set main timings to 8-11-8-28. – Leave any other options on Auto and be sure that Swizzle options are enabled if you care about stability. Restart and check if it’s booting. If it’s not, then you may need to set looser timings like 9-11-9/8-12-8/9-12-9 or just bump VDIMM. When you make it stable then first thing that you should try is to tweak Latency Boundary. the lower you set it, the faster the sub timings will be. Start from something like 7-10 and drop by 1 after fast stability test, you can use Spi32m. I was able to drop it to 5 using my memory kit. How to set 2600 on a bit looser timings. It’s not so hard. I took 2400 8-11-8-28 1N 1.75V settings and I just changed ratio to 2600, and the main timings to 9-12-9-28 1T. Result as you see below. Again when you have problems with booting or stability just add +1 to tRCD or to all main timings and/or bump VDIMM. Here I used one of cheapest BBSE kits – 2x2GB ADATA 2000-X / Xtreme series. 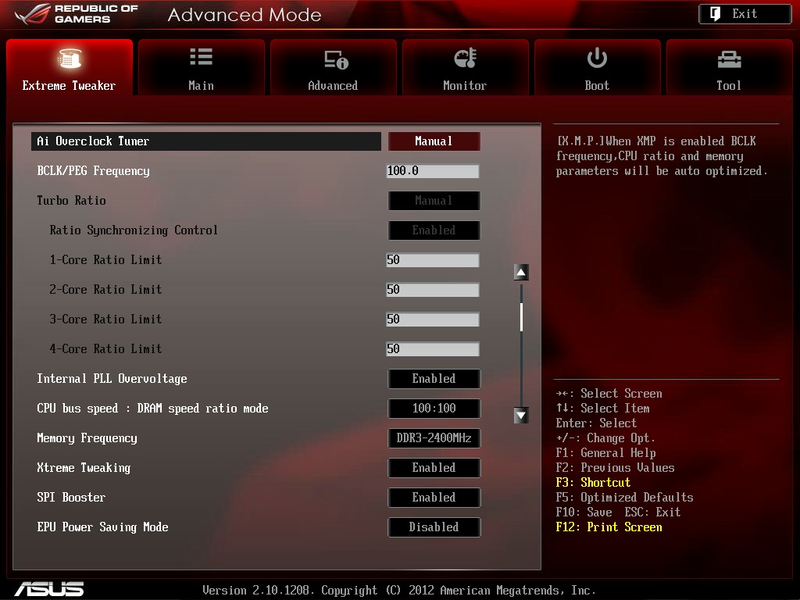 XMP settings are 2000 9-9-9-28 1.60-1.80V. BBSE are much harder to overclock on air since they need higher voltages and overheat much faster. I believe that on better cooling this kit can easily pass 2600, but so far it’s 2400 9-11-9-28 1T 1.82V; not much above the specifications with using 1.80V. Also here I used all base BIOS settings that I described above, only changing memory ratio, main timings, and memory voltage. I can say it could be better, but a jump from 2000 to 2400 is already a good result for memory that you can get for ~$30 on auctions like eBay. I don’t really have much to show here as my only Hynix based kit is really bad for overclocking. Here we have 2x4GB Patriot 1866 9-11-9-28 1.65V memory kit designed for X79 ( half of this kit ). 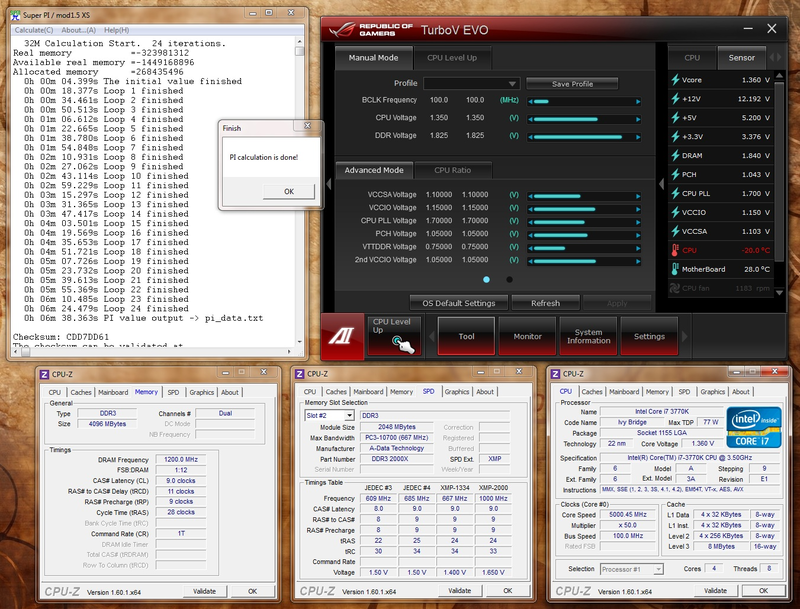 Overclocking in the same way as above, so the only changes are memory ratio, memory voltage, and main timings. Final result is 2133 10-12-11-28 1N. It doesn’t look like anything special, but with some better series that can be found, for example on the G.Skill RipjawsZ, should easily reach 2500+. As one of most popular memory kits last months, I have G.Skill TridentX 2x4GB 2400 10-12-12-31 2N 1.65V. My sample is running fine with voltage up to 1.85V at which I was able to reach the DDR3-2600 mark, and 10-13-13-26 1N timings. I wasn’t able to pass 2600 ratio no matter how I set voltage or timings. Again, to reach DDR3-2600 on this kit I used the same base settings as in previous tests. This IC can also work on some weird timings like 10-10-12-26 1T at 2400+ and standard voltage 1.65V . This memory is generally perfect for AMD. As not many IC available on market can make tight timings and like high voltage. 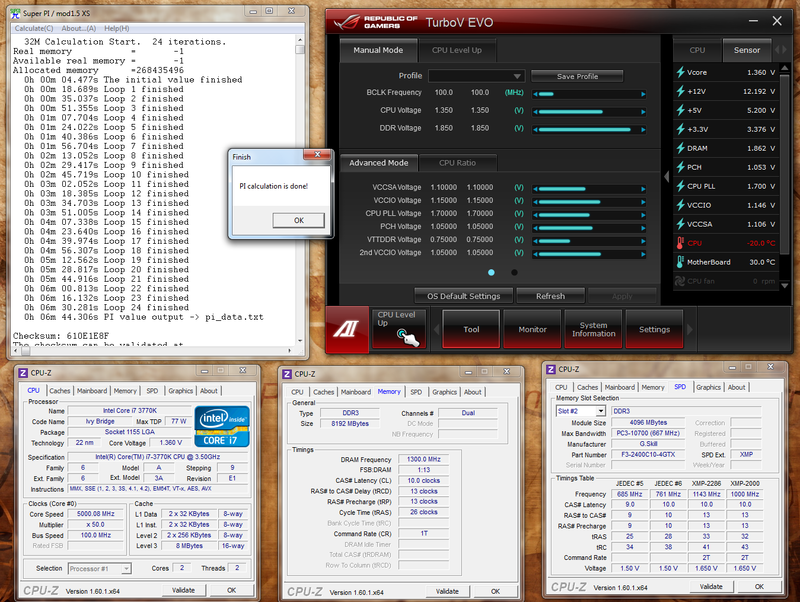 I’m using 2x4Gb Crucial Ballistix Elite 1600 8-8-8-24 1.50V, which in my case are going up to 2133 9-9-9-27 1N 1.70V. This memory can also run at 1600 7-7-7 1.55V or 1866 8-8-8 1.55V, but maximum clock is really limited (not much more than DDR3-2200). This is why it’s good option for AMD but not best for new Intel CPUs. At the end of this part a little summary of results. These results are of course without final tweaking, but can already show that good results are easiest to make on PSC based memory. In this case G.Skill RipjawsX. The difference between best and worst times is over 8 seconds. Most overclockers will say that tighter timings will always give better results in benchmarks. This part will show that it’s not always true for Ivy Bridge. 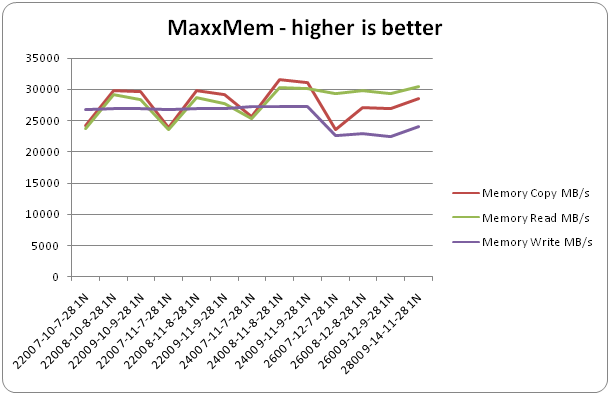 To test memory efficiency it’s best to use simple software like MaxxMEM Preview. Maybe the easiest way is to use the integrated Windows tool. 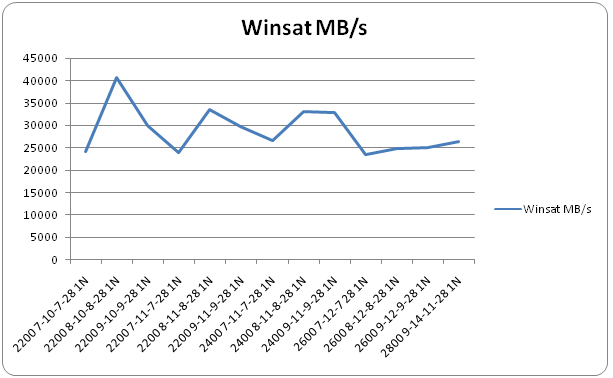 Open command prompt and type ” winsat mem “. ASUS Mem TweakIt software has “DRAM Efficiency Score” window (yellow score) that also says something if you set your memory right or not. Each test was performed at least 5 times and results are the average of all tests (if it’s not described otherwise). To compare results I will use G.Skill PSC based memory rated 2133 9-10-9-28 2T 1.50V and i7 3770K @ 5.5GHz, which will clearly show differences in performance. All timings except main are set to auto in BIOS. Here the better results were also at CL8, but the best of all is 2200 8-10-8-28 1N. The best results in Mem Tweak It are on anything with ratio 2400, like 7-11-7, 8-11-8 and 9-11-9-28 1N. Below I added a table with all average results from all tests. Not all of these settings are perfectly stable. Settings here are more to show the differences on various settings and if it’s worth it to push your memory to the limits on sometimes high voltage. From the above results we can pick 3 configurations for the next stage, which will be Spi32m test. 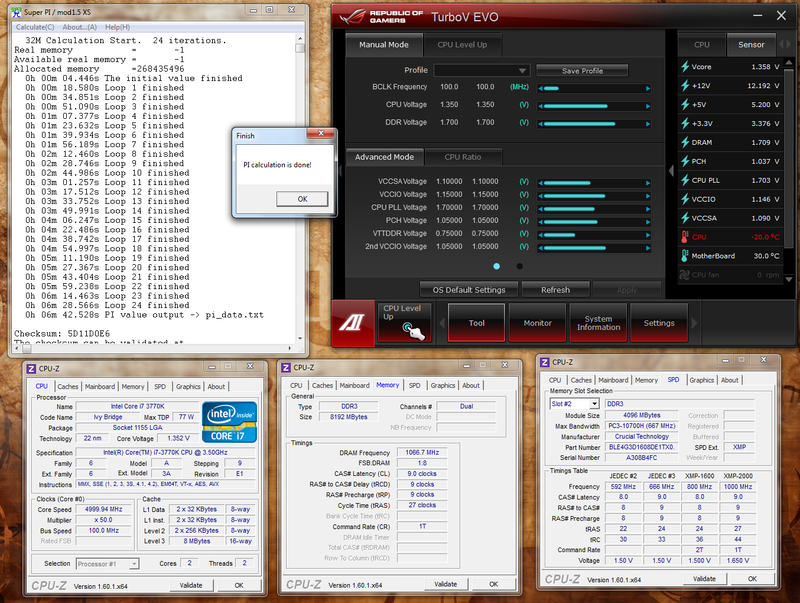 I tested on 3770K @ 5.0GHz, which will give us a stable base to compare results. I also added 2600 8-12-8-28 1N to this comparison. As we see here 2400 8-11-8-28 1N is the fastest setting. I have to add that almost all sub timings for all configurations were the same. 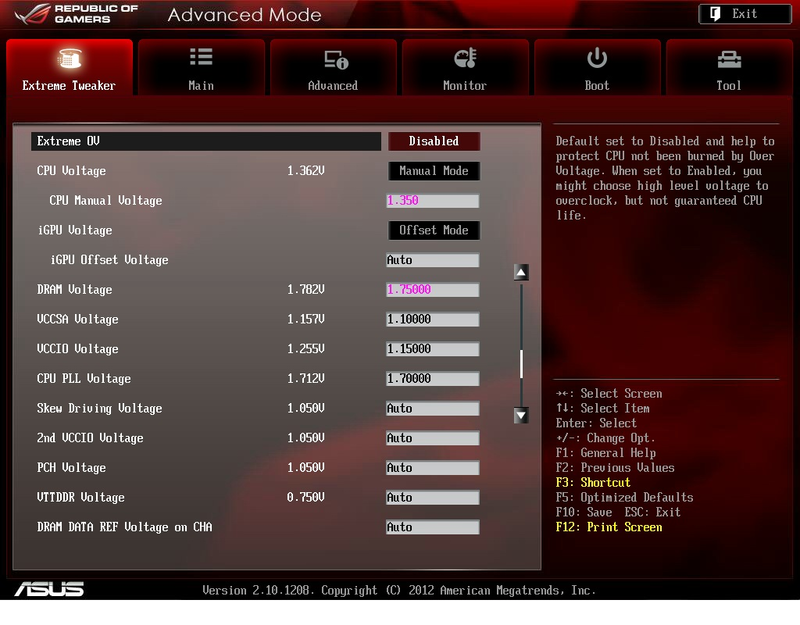 This part is mainly for all who wish to overclock IGP – Intel HD4000 Graphics. As we all know, system memory (RAM) in this case is also graphics memory, so in theory higher RAM speed is supposed to give better 3D results. 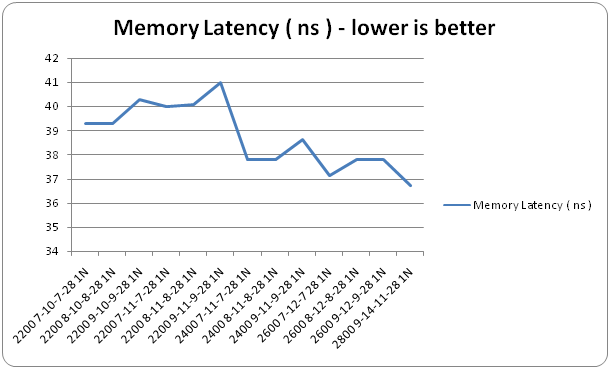 Looking at our memory efficiency results we can also pick the fastest memory setting for IGP 3D results. Examples are based on 3DMark 06 and 3DMark 11 using standard graphics card core clock. 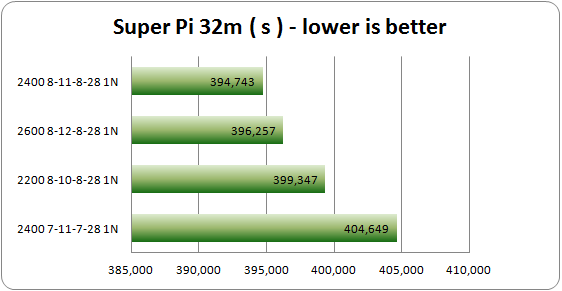 CPU clock will be the same as for Super Pi 32m testing, so 5GHz. For these tests I used 4×2 GB Corsair Dominator GTX3 2000 8-9-8-24 (2 kits of 2x2GB), and to compare I added 2x4GB G.Skill TridentX 2400 10-12-12-31. Over 600 Marks just because of memory settings is a big difference. Lets see how it looks like in 3DMark 11. 2400 8-11-8-28 is winning also in this stage. Difference in 3DMark11 isn’t big but the physics score is showing some advantages of tighter timings. You don’t need the most expensive memory to have a fast and good performing Ivy Bridge platform. Most older 2x2GB kits will be enough for any test and most games available on market. In reviews we already see DDR3-2600+ memory sets, but are they really fastest? Is spending money on new memory really worth it when you switch to a new platform like Ivy Bridge? In this guide you found out that memory above 2400 is not really worth buying even for benchmarks, and best settings are somewhere between high clock and optimal timings. This guide doesn’t include all aspects of memory overclocking. It’s more like a good base for all who wish to start with memory overclocking on their Ivy Bridge platform. Excellent guide! I've used it while it was in beta form and got a couple different kits of memory far higher than I'd managed previously. +1, great guide Woomack, thanks for all your hard work! Good guide. I have been referring to your beta guide also. Have you tried sticks with hyper's? You don't hear much about them lately, I was wondering if they are bad for IB or just need lots of tweaking? Hypers work, but some of the lower binned ones will crash out in SPI32m unless you pump them full of volts. Hypers are acting about what moocow said so 2500+ needs higher voltage and I mean like 1.92V ( what is max on M5G ) isn't enough for some sticks. I don't have any hyper based sticks but I saw some other users results. Other IC are more popular mainly because was much easier to get BBSE or PSC than Hypers in last years. There was time when most 1600 6-8-6 or 2000 9-9-9 kits were on PSC or BBSE ( with higher % of PSC ). Now in new kits are almost only Hynix or Samsung IC and hard to say when we will see something new from Micron who got rights to Elpida patents ( which merged with PSC before ). 1269 beats the hell out of my previous best with this ram at 1160! :thup:Thanks for this just what the Doc Ordered, good info.. I didn't add much sub timing tweaking as each memory is acting differently and there is really no special rule how to set them all. I'm talking mainly about tertiary timings as secondary are usually working near auto settings except maybe tRFC that can be tunned down for higher performance. Congrats Woomack on the excellent guide. You put forth a ton of work into this, and we are all better for it! As I mentioned in the guide I had no good memory based on Hynix IC when I was making article so for all who are missing this part and wish to see better results there is Geil Veloce 2133 review that includes tests up to DDR3-2800 here. Any chances you try playing around with the new Corsair Dominator Platinums? I got the 2400MHz 4x4GB CMD16GX3M4A2400C9 Platinums currently running Prime 27.7 stable with a 45x100 multiplier with a 3770K and Sabertooth Z77. I can boot no problem, into windows but Prime 95 ain't stable. You think I should throw more voltage on these Platinums (which are in fact ) Samsung IC chips? Dominators Platinum are on quite good Samsungs so if you have 2400 CL9 then it should make 2600 11-13-13 or 10-13-13. I was testing only TridentX on Samsung IC and at least all that I had were really bad for OC. Dominators are too expensive and I'm not getting any free memory for reviews etc ( at least not yet ;) ). Samsung chips are scalling till at least 1.85V but it's hard to say how long your memory will live on that voltage ;) Up to 1.75V seems ok. Try VCCIO 1.25-1.30V , VCCSA 1.20-1.25V and vdimm 1.70-1.75V.